On a March night in 1943, on the steps of a London Tube station, 173 people die in a crowd seeking shelter from what seemed to be another air raid. When the devastated neighborhood demands an inquiry, the job falls to magistrate Laurence Dunne. In this beautifully crafted novel, Jessica Francis Kane paints a vivid portrait of London at war. As Dunne investigates, he finds the truth to be precarious, even damaging. When he is forced to reflect on his report several decades later, he must consider whether the course he chose was the right one. 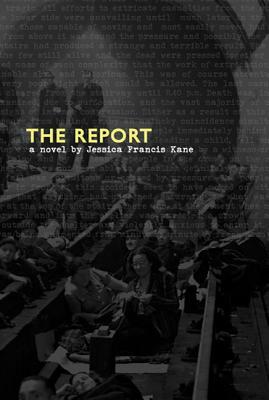 The Report is a provocative commentary on the way all tragedies are remembered and endured. Jessica Francis Kane is the author of the story collection Bending Heaven. Her stories have been broadcast on BBC radio and have appeared in a many publications, including Virginia Quarterly Review, McSweeney's, the Missouri Review, and Michigan Quarterly Review. Her essays and humor pieces have appeared in McSweeney's Internet Tendency and The Morning News.org, where she is a contributing writer. She lives in New York with her husband and their two children. Throughout The Report, Jessica Francis Kane does a wonderful job of dropping hints regarding what really happened on the night of March 3. Did you notice these hints as you read? If so, did they help you to figure out Ada's role in the matter before Laurie revealed it? The novel is structured so that the narrative moves back and forth between 1943 and 1973. How did this enhance your reading? Did you find it effective and satisfying when the two stories synced up at the novel's end? At the beginning of the third section, Kane writes: "The tragedy does not remain the story. As with any other public property, it is transformed by use" (73). Do you agree with this statement? What contemporary tragedies do you think have been "transformed by use"? Several chapters in the novel's third section consist of snippets of conversations between Laurie and the witnesses. Did you find these anonymous accounts compelling? What kind of effect do you think Kane was after? During questioning, Constable Henderson says to Laurie, "It's hard, sir, to know what's right" (138). Do you believe that sometimes accidents are unavoidable? Do you think the crush could have been prevented? During his conversation with Reverend McNeely after writing the report, Laurie says that "perhaps we should only sometime be held accountable for the unintended consequences of our actions" (203).Do you think Ada Barber is responsible for the deadly crush? Or do you agree with Laurie that she shouldn’t be held accountable? After James Low's funeral, Ada comes to this conclusion: "Surviving some disasters . . . you don't get to be happy again. You simply change, and then you decide if you can live with the change" (225). Do you agree with this or do you think that tragedy can transform some people for the better? Is it ever really possible to move on from a tragedy? The novel's last chapter seems to be the actual report Laurie wrote yet reads as something more lyrical and poetic. Do you think this is just a meditative final chapter? Or do you think this was the report Laurie originally submitted? Do you think it is an accurate reporting of the incident? What sort of similarities, if any, do you see between the cultural impact of the report and the 9/11 Commission Report?